Photo May Slightly Different From Actual Item in Terms of Color Due to the Lighting During Photo Shooting or the Monitor's Display. 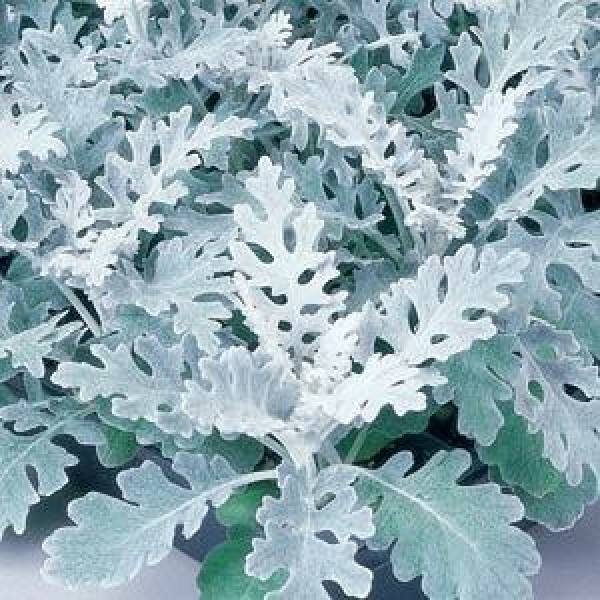 The dusty miller plant (Senecio cineraria) is an interesting landscape addition, grown for its silvery gray foliage. Lacy leaves of the dusty miller plant are attractive companions for many blooms in the garden. Dusty miller care is minimal when the plant is established. The foliage is silvery-gray to nearly white and has a soft, felt-like texture. The leaves may be shallowly cut like an oak leaf to deeply incised like the fronds of a fern. Dusty Miller is best known for its striking foliage, but it also produces loose clusters of 1-1½", mustard yellow flowers. Silverdust is part of the Senecio genus and is a Dusty Miller variety. Its scientific name is Senecio cineraria 'Silverdust'. This variety typically blooms in the following colors: Golden yellow. The leaves of this particular variety normally show as Taupe gray color. Silverdust grows as a Perennial and is an Ornamental. Being a Perennial, it tends to grow best over several years (approx 3 years and greater). Typically, Silverdust Dusty Miller is normally fairly low maintenance and can thus be quite easy to grow - only a basic level of care is required throughout the year to ensure it thrives. Being aware of the basic growing conditions this plant likes (soil, sun, and water) will result in a strong and vibrant plant. It is only necessary to cut Dusty Miller plants back if they become leggy during the growing season. Cut them back by up to half and they will quickly fill back out. In areas where it is perennial, cut it back to the ground in early spring when the new growth just begins to emerge. Dusty Miller plants are easy to grow from softwood cuttings taken in the summer or from seed. plants height with pot is 1 feet and pot size is 5 icnhes diameter. UP TO 40% OFF ON SUMMER BULBS CLICK HERE TO GRAB THIS OFFER.